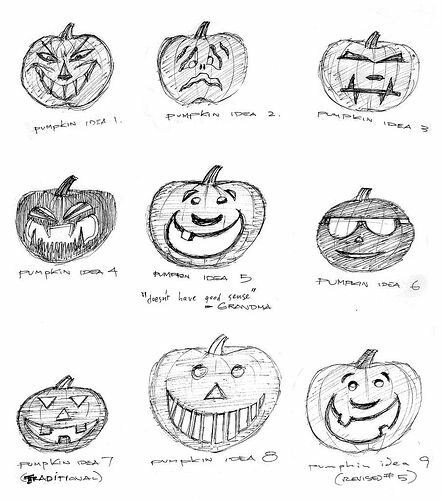 Nine designs for pumpkins. I believe I did these in anticipation of Halloween, 1987. On paper, and with Micron Pigma type pens. I like ’em. I always enjoyed Halloween particularly making decorations such as banners and posters. I also like giving out candy. My usual thing is to _demand_ that kids say “Trick or Treat” — that’s the ritual. My pet peeve is that kids come to the door while one batch of kids is getting served and just want candy. Sorry, the transaction is this: you have to be in costume (or do your best to be in costume); you have to say “Trick or Treat;” the candygiver has to dole out some candy and say something about your costume (or hassle you about your advanced age and sucky costume); and you have to say “Thank You” (well, you don’t have to, but it’s good Halloween manners. Joe Crawford blogged this at 6:40am in 2005 in August. The 16th was a Tuesday. You are reading this 14 years later. Comment. There are 8 comments Tweet. Send email. It has hashtags→ drawings memories .